Ryan Bednard (#35) and Alec Rauhauser (#23) could be up for some hardware when the WCHA preseason polls are released this upcoming Monday. Despite temperatures still hovering in the 80s here in northwest Ohio, the 2018-2019 season is just a couple weeks away from kicking off. This year’s squad is the 50th team in BGSU history to take the ice as a varsity sport and there’s considerable confidence that this year’s team could win a league championship, and even make a playoff run. The compiled coach and media preseason poll will be officially released on Monday (8/24/18) around 1 PM EST. The coach’s poll is compiled by friend of the site Shane Frederick of the Mankato Free Press, while our friends over at UAHHockey.com administer the media poll. My picks are listed below, separated by section. You can expand/collapse each section by selecting the header. Teams are listed based on their assumed finish at the end of the season (best to worst). Northern Michigan: Last year I had the Wildcats slotted in at #8 thanks to a new head coach and lost offense. They responded by going 19-7-2-2 in conference, good enough for a 2nd place finish. They eliminated BGSU en route to a loss in the Playoffs Finals, narrowly missing an NCAA playoff. NMU should soar again this season as they return 75% of their scoring. Backup goaltender Mathias Israelsson has transferred to Minnesota State, but he only accounted for 8% of the Wildcats goaltending wins last season. Bowling Green: I’m already expecting some chirps for placing BGSU second on the poll. There is no doubt about this: the Falcons should be really, really good this season. They return 79% of their scoring and all of their goaltending wins from last season. 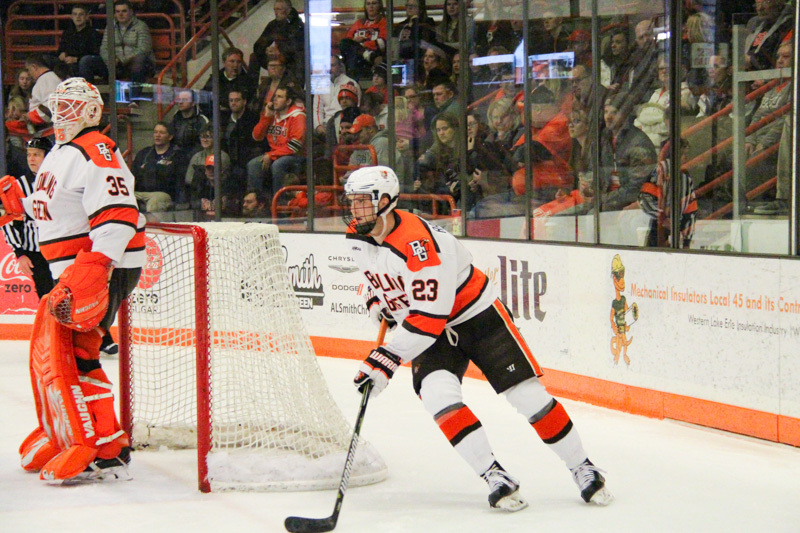 BG has an embarrassment of riches on their blue line with returning All-American Alec Rauhaser being joined by fellow offensive defenseman Tim Theocharidis and Will Cullen. If their sophomore class can continue to produce they might be playing for the MacNaughton Cup. Minnesota State: The Mavericks have been the perennial team to beat of the WCHA. This season could prove to be a small step back for MSU. The Mavs lost 35% of their scoring and lost all of their goaltenders. NMU transfer Mathias Israelsson will probably take the reins as their top netminder, but it could take a few weeks for MSU to hit their stride. Still, Mike Hastings’ teams have proven to be champions and this could be a case of reload, not rebuild. Michigan Tech: The Huskies are an interesting case. They lost 43% of their scoring but return all of their goaltenders. MTU shocked Northern Michigan in the WCHA Playoffs Finals last year and nearly upset Notre Dame in the NCAA Tournament. I think the Huskies are in the see-saw position: They could either be hosting a playoff series or fighting to qualify. Bemidji State: The Beavers see themselves in an unfamiliar position: Michael Bitzer has graduated and BSU has to find their new goaltender. They’ll also need to replace 43% of their scoring as they explore life post-Bitzer. Tom Serratore has a big task ahead of him to re-build the Beavers. I think BSU struggles to clinch a home-ice bid, but they should easily qualify for the postseason. Alabama-Huntsville: The Chargers have made incremental improvements in the WCHA, but progress has been glacial. I do think they’re at a point now where qualifying for the playoffs yearly should be easily attainable, but they’ll need to replace all of their goaltending this season. UAH opens the season against Miami in a series that’s probably going to be closer than most think it should be. Ferris State: FSU have moved on from goaltender Darren Smith who was arrested during the summer. But, they return nearly 80% of their scoring and continue to be coached by Bob Daniels. If Kapelmaster can shoulder the load and keep his team in games, they should make the playoffs. They could also be a dark horse that finishes in the top half of the league. Alaska: The Nanooks are now coached by Erik Largen: the third bench boss of UAF in as many seasons. Lance West joined UAH’s coaching staff after not having his interim tag removed in the job search. The Nanooks return all of their goaltending but lose 30% of their scoring. Fans in Fairbanks might be nervous in February during the run to the playoffs. Lake Superior: The Lakers missed the playoffs last year and the smart money is on a similar result this season. It was a bit of a head scratcher as Damon Whitten was extended for another season despite a lack of success at LSSU. They’ll need major improvement both defensively and offensively if they’re going to have a chance to make the playoffs. Alaska-Anchorage: The Seawolves won just four games last season. Matt Thomas was let go and Matt Curley took over. UAA loses 42% of their scoring and their rock in net, Olivier Mantha. Nothing is impossible, but it’ll probably be another rough season in Anchorage. All-WCHA Team votes consist of a first and second team. Three forwards, two defensemen, and one goaltender are selected for each team. Unlike past seasons media were asked to vote for just a single player for the Player of the Year award. The full results of the WCHA preseason polls and the preseason USCHO.com poll will be posted Monday afternoon. How do you think the season will shake out?